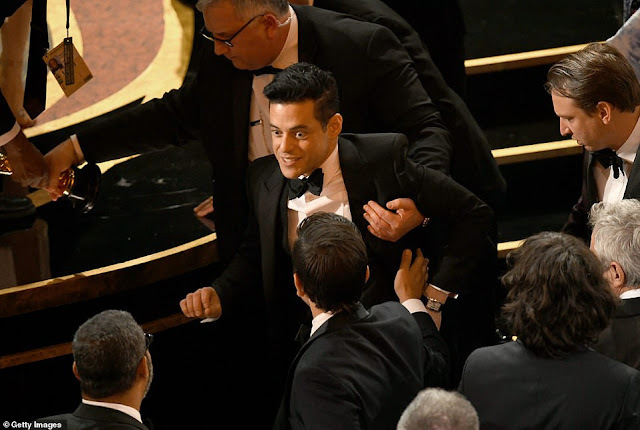 American actor, Rami Malek was treated by medics after he tumbled from the stage and fell into the audience following his best actor win at Sunday's Oscars at the Dolby Theatre in Los Angeles. Rami, 37, who portrayed Freddie Mercury in 'Bohemian Rhapsody' which gave him the win looked shocked when the incident happened before medical professionals rushed in to assist and treated him in the front row of the venue before taking him to a private area backstage. According to officials, Malek did not suffer any serious injuries in the incident which occurred after the ceremony concluded.